As hairdressers, we know that thinning hair can happen for a variety of reasons – including stress, age, illness, medications, and, in women, the menopause. Whilst you may not be able to completely stop hair loss, there are ways to manage it and avoid making it worse. Here, we’ve given some points you may want to think about, but remember that everyone’s hair is different. Do get a consultation with a professional stylist – or even a Trichologist – they can give you specific advice for your hair type and the current contributory factors in your life. You can change the appearance of thinning hair by opting for a short, layered style. This creates the illusion of greater body and gives bulk to your hair. You can also make a difference by changing the way you have your parting (or creating one altogether) to hide thinner patches of hair. Brush your hair before you wash it to minimise tangles afterwards – as hair is more fragile when it’s wet. Wherever possible, opt for soft hairbrushes rather than combs, and apply only a gentle pressure. Tackle hair in small sections rather than brushing through tangles in one big go. This will all place less stress on any weak hair and eliminate any further damage. When it comes to washing, select a very gentle shampoo which won’t dry out hair or irritate your scalp. 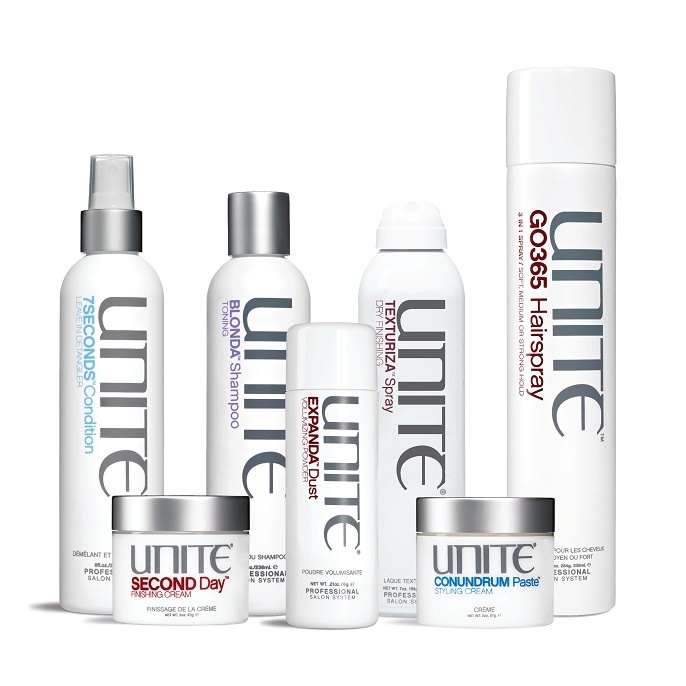 One of the hair products we roccomend is UNITE U Luxury – Pearl and Honey Shampoo and conditioner. This due has won best professional shampoo and conditioner of the year 2017. 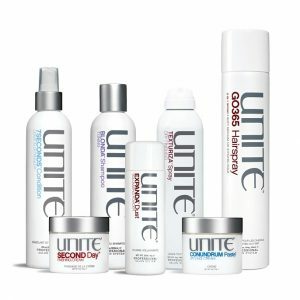 And at least once a week use a nourishing conditioning treatment such as UNITE 7 Seconds mask which restores moisture and shine. To add extra fullness at the roots, and greater body overall, try blow-drying hair initially in the opposite direction to your natural growth. When your hair is dry, brush it back the other way. To further help, try a volumiser spray such as UNITE ‘Boosta Spray’ which is light and non sticky. Use this before you start drying, as this will help to give your hair added body. With volumisers, they are best applied near the roots before hair drying. But do be careful to blow dry on a low setting and with the heat turned down. This will avoid dehydrating and placing further stress on weak hair strands. It’s worth checking you are getting all the right vitamins and minerals for your hair. You can get these from a balanced diet, but there are also special vitamin supplements on the market to boost hair vitality. Where possible, build superfoods such as fish, berries, lentils and seeds into your diet. They’re packed with essential fatty acids for healthy hair and scalps. In particular make sure you are getting enough of vitamins C, E, B3 and B7 in your diet. Another thing to check is if you’re hydrated enough. Drink lots of water to replenish and do keep an eye on your alcohol intake as this can dehydrate you. On hot days, after exercise, or if you’ve been blasted by air conditioning or central heating, up your intake of water. All of these conditions can cause your hair and skin to dehydrate more quickly. And if you’re going to be out in the sun a lot, take a UV protection spray or, better still, wear a hat. Many people consider using colour treatments to disguise thinning hair. Well-placed highlights can work well to create texture and illusions within the hair. Ask your hair designer for more information on contouring your hair. If you have thinning hair and would like to discuss what hair styling and approaches would help it, why not book in for a consultation with one of the team? We have plenty of experience of helping people who have experienced thinning hair from a variety of different reasons. We can give you a highly discreet, personal consultation in our Manchester Hair Salon.